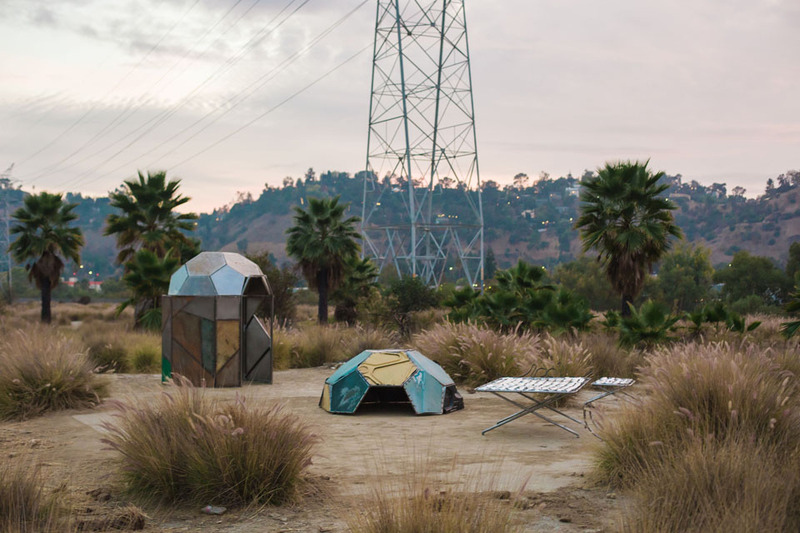 Beatriz Cortez, structures from Trinidad: Joy Station interacting with the Los Angeles River at the Bowtie Project. Courtesy of the Beatriz Cortez and Commonwealth and Council, Los Angeles. Photo by Gina Clyne. California State University, Northridge professor and international artist Beatriz Cortez will have her first major solo exhibition, which explores multicultural coexistence through geometric spaces, at the Craft Contemporary from Jan. 27 to May 12. Cortez’s work will be displayed in the exhibition “Trinidad/Joy Station” at the museum, located at 5814 Wilshire Blvd. in Los Angeles. An opening reception will take place on Saturday, Jan. 26, from 6 to 9 p.m.
With “Trinidad/Joy Station,” Cortez said she wants viewers to get a feel for the migrant community and visualize how migration is a way of life. As an immigrant from El Salvador, Cortez said she is able to use her knowledge of shared experiences with the community through her artwork. The Craft Contemporary will hold exhibition-related workshops and events in conjunction with the exhibition, which will include an artist talk with Cortez and an igloo-construction workshop on ancient Inuit building methods. Cortez’s solo artist talk is free and will begin at 3 p.m. on Saturday, Feb. 16. Then, on Saturday, March 9, the “Ancient Inuit Geometries: Igloo Construction Workshop with Beatriz Cortez and Rafa Esparza” will take place from 11 a.m. to 1 p.m., and another artist talk “The Untimely Conversation with Beatriz Cortez and Rafa Esparza” at 3:30 p.m. for $30. All artist talks and workshops will be held at the Craft Contemporary. “It has been amazing to work with the Craft Contemporary,” Cortez said. “I made the work myself, with the help of a group of friends who are also a part of immigrant families, in a community welding shop. I was not trained as a welder — none of us were. Cortez has another piece, “Tzolk’in,” on display at Occidental College. The work is a kinetic machine, based on the Mayan 260-day agricultural calendar. For more information on Cortez’s solo exhibition, visit: https://beatrizcortez.com/upcoming-shows-proximas-exposiciones/.